The resort town of Abbottabad is a familiar one to day-tripping Pakistanis seeking escape from the urban tumult of the Punjab plain. Just 75 miles (120 km) from the capital, Islamabad, colonial-era bungalows abut modern whitewashed villas on small streets largely devoid of traffic. It's the kind of place where families take a stroll as the day cools into night, where you might still go and ask a neighbor for a cup of sugar. So when residents learned that Osama bin Laden had been living there, possibly for several years, they were shocked. Much less understandable is the claim, being made by defensive officials in Islamabad, that no one else in Pakistan was aware that bin Laden was in Abbottabad. That the world's best-known terrorist could be hiding in plain sight may be plausible in a country where privacy is a sacred right. But in Pakistan, household secrets rarely stay that way. Housekeepers and servants gossip at the back doors, and drivers chuckle over the infidelities of their employers. Anything that raises more than an eyebrow is quickly brought to the attention of "the agencies"  local parlance for Pakistan's ubiquitous intelligence groups, which closely monitor the daily lives of citizens, as much in an effort to collect information as to enforce a paranoia-driven code of good behavior. As any foreigner living in Pakistan knows, "the agencies" are especially adept at ferreting out the presence of strangers. The crackle and click of telephone lines is a constant reminder that no conversation is private, the crew-cut men in beige who materialize at inopportune moments proof that one is never quite alone in Pakistan. So it beggars belief that absolutely no one knew who was living in a compound that was, according to a U.S. official, "custom-built to hide someone of significance." John Brennan, President Obama's adviser on counterterrorism, didn't arch his eyebrows when he declined at a May 2 press conference to "speculate about who [within the Pakistani leadership] had foreknowledge about bin Laden being in Abbottabad." But his skepticism was palpable. The location of bin Laden's last address "there, outside of the capital, raises questions," Brennan said. Those questions are at the heart of the renewed debate about one of the U.S.'s oldest partners in the battle against terrorism. It can be summed up quite simply: Can Pakistan be trusted? If not, what can the Obama Administration, so keen to extricate U.S. troops from the region, do about it? 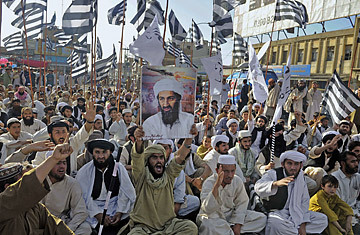 And just how safe is Pakistan now that bin Laden is gone? The answers are not reassuring. Bin Laden was not the cause of Pakistan's problems. But his presence in Abbottabad was a symptom of a deeply ambivalent official approach to militancy that threatens to undermine the stability of this nuclear-armed state. Elements in the Pakistani military have long viewed militants and extremists as useful proxies. A blinkered focus on a perceived threat from the old enemy, India  with which Pakistan has fought three wars over the disputed territory of Kashmir  has led to massive military spending, depriving generations of Pakistanis of good education, adequate health care and the basic building blocks of an economy  electricity, irrigation, roads. Then there's the sheer corruption and incompetence of most Pakistani institutions: the leadership, both civilian and military, has pursued power at the expense of building a functional political apparatus that promotes accountability over cronyism and punishes inefficiency. Even as Pakistan attempts to function, it is racked by insurgencies  one in the western province of Baluchistan, where residents are demanding a share of the oil and gas wealth coming from their lands, and another in the northeast, where the Pakistani Taliban are forcing their particular brand of radical Islam on a population long neglected by the state. A weakening relationship with the U.S., a source of support and financial aid, could cause Pakistan to lash out in unpredictable ways. Now, more than ever, Pakistan is the most dangerous country in the world. Since the early days following the attacks on Sept. 11, 2001, Pakistan's leaders have tried to balance their interests between continued support for militant organizations deployed in a proxy fight against India and a desire to benefit from a lucrative relationship with the West. This allowed Pakistan to help capture several top-ranking al-Qaeda members, even while it turned a blind eye when homegrown militants crossed into Afghanistan to fight coalition troops there. The schizophrenia spread to the populace: in a poll conducted early this year, Pakistanis overwhelmingly supported bin Laden but ranked the threat of terrorist attacks as one of their greatest fears. Their leaders have failed to guide them out of the '90s-era embrace of jihad as foreign policy into a modern era in which education, innovation and human resources are a nation's most competitive weapons. Equally at fault is U.S. willingness to support the Pakistani military, which promises quick solutions to regional problems (even if it does not always deliver) over the slower process of investing in the institutions of civil society. Now Pakistan is on the verge of collapse, held up only by a thin shell of military might with loyalties only to itself. See TIME's complete archive of Osama bin Laden coverage.